Siddha Yoga is a spiritual group teaching traditional Hindu or yogic practices both in India and in the West. The group has an organizational foundation by the name of SYDA Foundation (a domestic not for profit corporation registered in in New York State), founded by the second guru of the Siddha Yoga lineage, Swami Muktananda (1908 – 1982). The guru who is the latest in the lineage of teachers of Siddha yoga is a woman, Gurumayi Chidvilasananda (born June 24, 1955 ). The group has its U.S. headquarters at a large country ashram called Shree Muktananda Ashram composed of two former resort hotels in South Fallsburg, New York State. Its original home remains the ashram called Gurudev Siddha Peeth at Ganeshpuri in rural Maharashtra, India. 1956 – Muktananda founds Gurudev Siddha Peeth the main Siddha Yoga ashram, located in Ganeshpuri, India. 1961 – Bhagawan Nityananda dies. 1970 – 1981 Muktananda tours the West at his students’ invitation, three times. 1979 – Muktananda founds Shree Nityananda Ashram which later becomes Shree Muktananda Ashram. 1982 – Muktananda dies, before his death he makes Chidvilasananda and her brother Swami Nityananda co-gurus of Siddha Yoga. The central tenet of Siddha Yoga is that the goal of seekers is to find the Self, inner consciousness, in all humans, and in everything. The aim of Siddha Yoga is to help every human being realize and experience that they and all other humans have an inner Self which is perfect and divine, and that a reachable goal is the end of human suffering and the attainment of supreme bliss. The primary philosophical bases of Siddha Yoga are Kashmir Shaivism and Vedanta. Meditation – The form of meditation practiced is silent with attention focused on a mantra and/or on the flow of breath. The mantra most often used for meditation is the mantra Om Namah Shivaya. 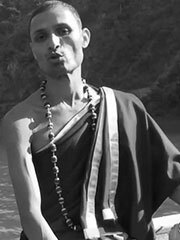 Chanting – Students chant sanskrit mantras which can either be Nama Sankirtana (chants that consist of short sanskrit phrases) or swadhyaya (chanting of longer texts). The texts that are chanted most commonly include the Guru Gita, morning and evening Arati, Shree Rudram, and the Kundalini Stavaha. seva – Students practice seva through volunteer work at either an ashram or a center in their city. Seva can also mean any service done as an offering to God. dakshina – Dakshina refers to a donation of money and/or material objects to the organization. Satsang refers to group meetings or programs, usually held weekly, at the ashrams or one of several hundred small Siddha Yoga meditation centers around the world. A typical satsang program will include talks by one or more students or a visiting swami, several periods of chanting (in sanskrit), and a period of meditation. The centers usually conclude the program with announcements and socializing. Startup.com References in two scenes: One is a copy of a painting of the Goddess Lakshmi from the Shree Muktananda Ashram, the other is a scence where Kaleil is chanting the Guru Gita while driving. The «Leaving Siddha Yoga» organization exists to support people wishing to leave.